Becky Lynch is out first to a new style in attire followed by NXT Champion Charlotte. Becky trips Charlotte, and covers for a two count. Becky with a head lock take over, but Charlotte slides out and follows up with a kick to the gut. Charlotte throws Becky into the corner, but she misses the splash and takes a kick the the chest. Becky attempts to send Charlotte into the other corner, but takes a right hand. Charlotte works the left knee of Becky. Charlotte with a knee drop on the damage leg of Becky. Charlotte locks in a leg submission to increase pressure on the damage leg. Charlotte continues to work the leg until Becky makes her comeback with a kick to Charlotte followed by a series of clotheslines and a drop kick. Becky hits several leg drops for a two count . Charlotte kicks the leg of Becky and hits Bow Down To The Queen. Bayley and Becky Lynch are out first, followed by Sasha Banks and Charlotte. Bayley and Sasha start things off. Bayley take Sasha down by the arm. Charlotte tags in and gets caught with an armbar by Becky before Bayley comes in to work over the arm as well. Becky and Bayely hits a double suplex to Charlotte and a double clothesline to Sasha as we go to commercial. Back from the break with Bayley getting sent into the apron before Charlotte continue the beat down in the ring. Sasha and Charlotte double team Bayley in the corner and Charlotte with a knee drop to Bayley for a two count. Sasha with a chinlock before Charlotte tags back in, Charlotte with a choke in the corner. 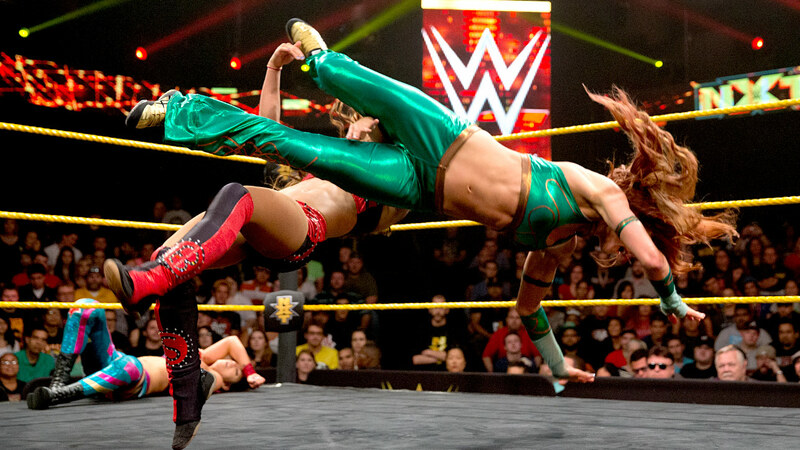 Bayley kicks Sasha into Charlotte and tags Becky. Becky a series of legdrops into a cover for a two count to Sasha. Charlotte breaks up the pin and sends Bayley to the floor and Charlotte tags in to hit Bow Down to the Queen on Becky for the win. Summer Rae is out first with Charlotte and Sasha Banks. Becky Lynch is out next channeling her inner Irish side. Summer runs after Becky but Lynch ducks. Becky does an Irish dance which encourage Summer to dance herself. Summer with a clothesline into a cover but Becky bridges out followed up with a arm drag to Summer. Becky applies an arm hold on Summer. Becky with a big kick to Summer. Summer with a headlock. Summer throws Becky down. Summer is distracted by The BFF’s on the outside and gets rolled up. Becky with leg drops followed by a cover for a two count. Summer tries to kick Becky but get caught and hit wyith a big suplex for the win.